Language constantly evolves, and new words are invented while old words take on new meanings. 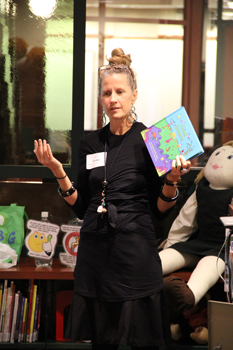 Kindergarten and Class 1 students learned about such a linguistic shift thanks to a visit from author Jeanine Behr Getz, who shared with the girls her book Think Green! Green, as Mrs. Getz told the girls, no longer refers to just a color; it also now refers to protecting the environment. “We’re going to talk about what it means to ‘think green,’” Mrs. Getz added. Mrs. Getz explained to the students that her book had been entirely printed on recycled, chlorine-free paper and contained only environmentally friendly inks. She also told them that because she could not find a publisher who could produce such a ‘green’ book, she started a company that could — Kids Think Big! — and published the book herself. It was such a commitment to environmental conversation that Mrs. Getz hoped the students would follow, although she knew they could not start their own companies just yet. But they could certainly follow the lead of the characters in Think Green!, who use recycled paper at school; don’t let the water run while brushing their teeth or washing their hands; compost food if they can; and take re-usable bags to the grocery store. The examples were readily absorbed by the students, who are already on their way to thinking green.